I realized the other day that I've been sharing my gram's recipes and some stories about her and her cooking, but I haven't shown any photos of her or her house. Besides the usual family snapshots from birthdays and long weekends, I actually have quite a few photos of just her house and belongings, remnants of a slightly (ok more than slightly) self indulgent photography project about "painting a portrait of a person through the things they owned." Yadda yadda yadda. Really, I just wanted an excuse to photograph her beautiful house and built a justification from that. Anyway, I've decided to occasionally share a photo or two of my Gram and her house, in between recipes. 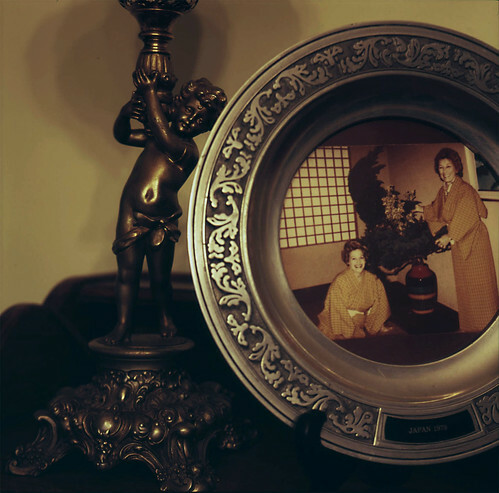 This first photo is of a souvenir plate that she brought back from a trip to Japan in 1979. I know she liked this photograph of herself, because the plate was always on prominent display next to one of the many candy dishes in the living room. My grandmother is the smiling woman kneeling on the mat on the left. The woman standing on the right is her friend Roselle Como, who my grandmother sometimes traveled with. Just look at how immaculate her hair is in this photo! That's how her hair looked for the entirety of my life, although perhaps the color wasn't always natural. If you want to see the photo in more detail, just click through to the Flickr photo page, and you can view a larger image. What's up next, recipe-wise? I don't want to overexcite you, but I've been eyeballing my gram's renowned bran muffin recipe. Very neat. How beautiful your memory of your Grandmother. Roselle Como! Wife of wonderful crooner, Perry Como. I've read of their devoted romance. Your Gram had some fancy friends!